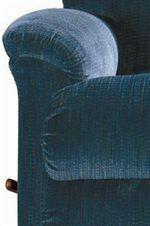 This Wall Saver recliner is a perfect complement to your casual lifestyle. With the full-body comfort of an inviting chaise seat and the luxurious softness of genuine top grain leather or a variety of fabrics, this generously-cushioned design is sure to be a favorite resting spot in any room. Accented by a channeled pillow back, flared arms and alluring curves throughout, the composition of this piece is flawless. The Larson Power-Recline-XRw Wall Saver Recliner with USB Port by La-Z-Boy at Jordan's Home Furnishings in the New Minas, Halifax, and Canning, Nova Scotia area. Product availability may vary. Contact us for the most current availability on this product. With style and beauty the Larson collection complements your casual or contemporary living room design. Generous, alluring curves accent the comfort and style of the Larson collection while adding to the versatility of the collection. Each piece fits into nearly any room in your house with equal aplomb. Bring this style rich collection into your home and see the difference it makes in your decorating. The Larson collection is a great option if you are looking for Casual furniture in the New Minas, Halifax, and Canning, Nova Scotia area. Browse other items in the Larson collection from Jordan's Home Furnishings in the New Minas, Halifax, and Canning, Nova Scotia area.